Swansea City are not safe from Premier League relegation, even after reaching 40 points for the campaign, according to manager Francesco Guidolin. 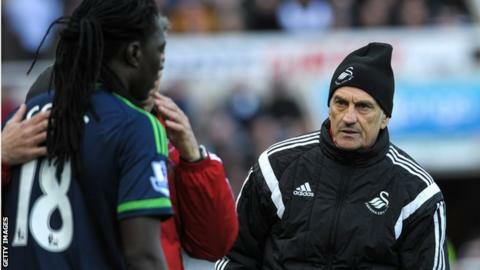 The Swans were well beaten by Newcastle on Saturday and Guidolin has warned Swansea must avoid complacency. "We can't take our foot off the pedal, we need some points for mathematical security to stay in the Premier League," he explained. "It's not done yet, so we need points. I don't know how many." "One, two three - but it's important not to relax. "Football is particular and I have seen many surprises in my career, so it's important to be focussed and be aware." Guidolin had previously stated that he felt Swansea were confident of securing their Premier League status. "Yes, I think so. It is virtual safety. It's not real yet but now we can see forward, not behind," he said after their 1-0 win over Chelsea. However, Guidolin felt Swansea's performance at the weekend showed there is work to be done at the Liberty Stadium, especially with a daunting trip to Premier League leaders Leicester next on the horizon. He said: "Newcastle deserved to win, but the result is heavy for us because yes, Newcastle played better than us with more intensity, with focus. "But in the second half, we had some situations, some possibilities to score and draw level, and maybe the match could have changed. "But this is our job, it's my job. I know football. "Maybe after three months of hard work to achieve where we are in the table, it's possible to have a bad day, and today for us was not a good day."